Raccoon Removal Pest Control in Toronto ON are a real nuisance to many people especially in the months of winter when they come to people’s homes to seek for warmth. Their presence in the homesteads is known to result into wanton damages as they will destroy virtually anything they come across. But these are the problems we have been trying to eliminate for over fourteen years now by offering raccoon removal service to the residents of Toronto. Don’t let these charismatic furry animals bring more damage to your home when we are just a phone call away with the right solution. There are a number of places which a raccoon can use to gain access into your premises. Their small size makes it possible for them to use the chimneys, roof vents, pipes, dormers etc. When you engage our services for raccoon removal Toronto, ON we will conduct a detailed investigation in such places and identify the exact location that the raccoons might have used to gain access. We will then repair any structural damages that they have caused and instill further reinforcement on the opening to make it difficult for them to enter for a second time. When you contract us to carry out raccoon pest control, we will not stop at anything until we ensure that your home is totally ridden of this creature. 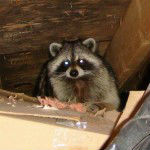 We have teams of excellent animal removal technicians who will leave no stone unturned while looking for the raccoons. But while we do this, we consider all the techniques that we use. We avoid using any form of aggression that might result to the death, injury or stress to the raccoons. Our business is to get them out of the premises so that they can find other places where they will leave without causing you any havoc. 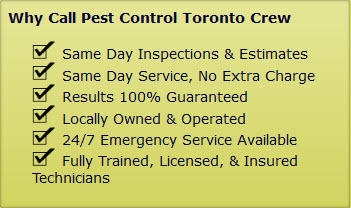 Contact the Pest Control Toronto Crew today and let us get rid of all the raccoons in your compound. We proudly service Ajax, Brampton, Burlington, Etobicoke, Maple, Markham, Milton, Mississauga, North York, Oakville, Oshawa, Pickering, Richmond Hill, Scarborough, Whitby, Woodbridge and Thornhill. Raccoon Removal Pest Control in Toronto ON call (647) 557-7978.